HAIM; 3 sisters that know how to rock. Este, Danielle and Alana Haim are an American alt/rock band from the ‘City of Angels’, Los Angeles. Flying into the music scene 10 years ago now, this band never fails to produce some showstoppers. Something To Tell You is the second studio album from HAIM. Released on July 7, this album consists of 11 tracks, one of which is lead single “Want You Back”, released back in early May. “Want You Back” kicks the album off in style, bringing a country edge to this beautifully crafted catchy tune. This song is a summer sizzler with a deepened heart hitting beat. This one will have you swaying from side to side, drinking cold beer and chilling out on a hot Summers night. The next track “Nothing’s Wrong” keeps its upbeat undertones and solid drum beats. However, it takes on a real old school vibe with its Shania Twain similarities. A lot of comparisons can also be made to music hitting the late 1990’s. For example, the pure and untouched vocalisations from the sisters, reminds me of music my parents used to play me when I was little. A very nostalgic track. “Little Of Your Love” is up next. This song is a real gem. A track that can infuse rock, gospel, and indie/pop is a song to be talked about. Lyrics such as “You’re so close now, so don’t let me down. Give me just a little of your love and I’ll try“, are truly heart-breaking. Miraculously however, this song still carries its upbeat feel. This is a song you would listen to in your car. It would be blaring out of the windows as you whizzed down the highway. It’s also very movie soundtrack. I could imagine this song being a hit in movie about teenage heartbreak and betrayal. “Ready For You“, the fourth track on the album, takes on an entire different approach musically. An almost Michael Jackson staccato beginning slides us into the typical HAIM heartbreak lyrical chorus. A powerful and lyrically important song, about having love and hope in a partner you might not have been ready for, but now you finally are. The album’s title track “Something To Tell You” is a song driven by noticeably pain fuelled vocals. Lyrics such as “all the way down a fall from grace I was in for a heavy one when I could feel you pull away“, are sung with a large amount of feeling and passion. Although this song is more of a power ballad, it still manages to be drenched with upbeat drum thrashes that pound the soul into another dimension of the magic of music. Up next is “You Never Knew“. This song kicks off with an 80’s feel to its music. One of the main things that I’ve always loved about HAIM, is how much they appreciate older music. They are not a band trying to appeal to the hearts of Chart show fanatics. They write for themselves, they write from experiences. And this song only clarifies that. “Kept Me Crying” is a magically dreary rock ballad that takes us perfectly into what’s next; Found it in silence. This track has an unexpected start. A very progressive production effect leads us into what sounds like Coldplay’s “Viva la Vida”. This song is beautifully bittersweet. A full and flavoursome beat with heart-breaking lyrics that make you listen. A true masterpiece. Next up is “Walking Away“. This song fills the mind with a more R&B soulful vibe to it. The repetitive and high-pitched “walking away” lyric is repeated throughout the song. It’s a massive earworm of a lyrical interlude that really adds that little something extra to the fairly chilled out Rhythmic sound this song faultlessly carries. “Right Now“, the penultimate song on Something To Tell You. This track is based on magnetically smooth and rich vocalisations. This is first song on the album that has allowed me to listen to the magic of a piano and a vocal. Simple, but gloriously effective. Atmospheric rock instrumentals are collapsed into the song as it progresses into one of the best pieces of music on the album. “Night So Long“, the big finale. A similar vibe to that of “Right Now”. A slow, painfully romantic song with an eerie vibe to it. This is certainly a gorgeous and spine-tingling way to end an album full of love, pain, romance, heartache and bold beats. On a whole, this album takes you to a wonderland of breakup blues, betrayal, and most importantly, fantastic music. Something To Tell You will have you dancing, swaying, singing, crying and feeling all kinds of musical madness; ENJOY! 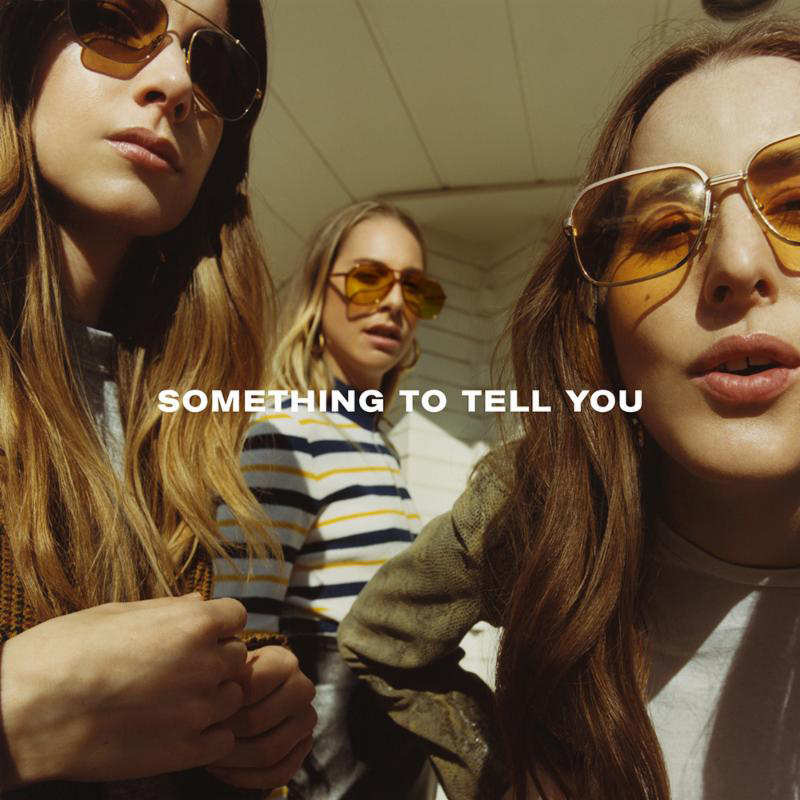 HAIM’s Something To Tell You is out now via Polydor Records, stream or purchase it here.